A look at key production and concept models at the 2013 Frankfurt auto show. Reviving an historic nameplate for GM's Opel brand, the low, sleek Monza concept is more sports brake. “You don't just climb out, you float out,” Mark Adams, Opel's head of design, said of the hybrid-electric Monza and its gullwing doors. “This car is a study that will have a long-term impact on the next generation of Vauxhall and Opel models,” Opel CEO Karl-Thomas Neumann said. And perhaps Buick, too, since Opel and Buick are under orders from Detroit to cooperate even more. Under the body is the same plug-in hybrid setup found in the Chevrolet Volt and Opel Ampera. Mercedes-Benz will replace the CL coupe with the S Class coupe -- previewed with this concept -- in late 2014. Under the hood is a 4.7-liter V-8 biturbo that generates 449 horsepower. If you want to grow, you have to play in the hot segments. For Jaguar, that means fielding a crossover for the first time to go up against rivals Lexus, BMW, Audi, and Mercedes, which plan to add crossovers of every size. The C-X17 concept is built off an all-new aluminum architecture and will spawn a family of future Jaguars in the C and D segments. With sales in a dive everywhere but China, Volvo rolled out the Concept Coupe to preview styling on the next XC90 crossover coming in early 2015. It's one of a string of new or redesigned models planned to add more luxury and esteem -- and higher prices -- to the Swedish brand. 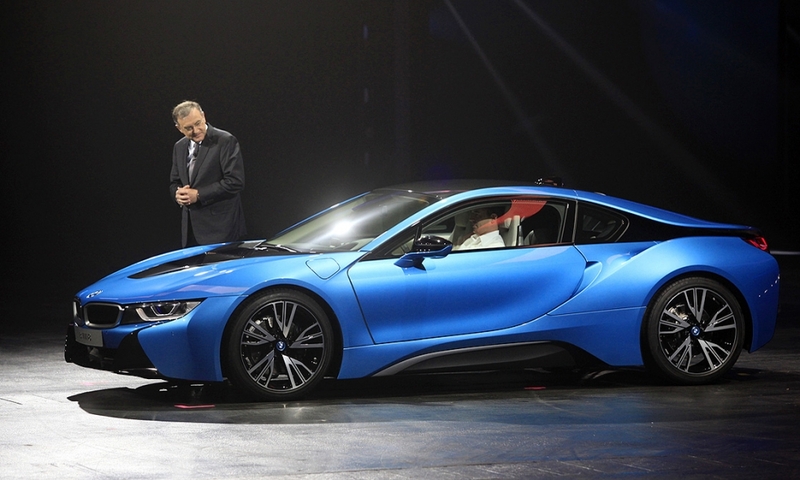 BMW says the plug-in hybrid i8 coupe, shown in production form in Frankfurt, will go on sale in the first half of 2014, after the all-electric, compact i3. The i8 features a modified electric drive system from the i3 that is fitted over the front axle, as well as a 1.5-liter, 3-cylinder engine that produces 220 hp. The Q30 concept, shown, previews a compact model for the brand. The Mercedes crossover family is expanding with the GLA compact crossover, a model with one core goal: draw new and younger buyers in China, North America and Europe to the brand. Smart's next ForFour microcar gets a preview with this four-door, four-seat concept. The production version is being developed jointly by Daimler and Renault. It's still a few years away from hitting U.S. showrooms. Audi says the new A3 cabriolet, a compact four-seater, will come in three trim lines: Attraction, Ambition and Ambiente. It will also have a bigger footprint. The length has grown from 13.91 ft. to 14.50 ft.; wheelbase has expanded from 8.46 ft. to 8.53 ft., and the width has grown from 5.81 ft. to 5.87 ft. On average, the three engines available at launch will improve fuel economy by 12 percent over the engines in the previous model, Audi says. Lexus hinted at plans to enter the compact crossover market with the LF-NX concept. Ford plans an upscale version of the Mondeo sedan sold in Europe to be called the Vignale. Instead of tapping Lincoln, Ford decided to introduce the Vignale line, which will feature a sedan and wagon. Ford says Vignale owners will be treated to complimentary lifetime car washes, invitations to special events, and have their vehicle picked up and dropped off for service appointments.